Aspen Times fileThe arson investigation into a house fire in the Willits subdivision of Basalt continues. An insurance company has offered a reward for information leading to a conviction in the case. Safeco Insurance placed doorknob hangars on homes in the neighborhood in late January announcing the reward, Safeco spokesman Mike Plaster said. “Fire officials and/or independent experts suspect the recent fire in your neighborhood was a result of arson,” the hangars say. Basalt Police Department is treating the fire at 510 Lake Court as an arson. Investigators from the police department and Colorado Bureau of Investigation (CBI) determined an accelerant was used on the outside of the house at 510 Lake Court. The flames spread quickly and the house was a total loss. 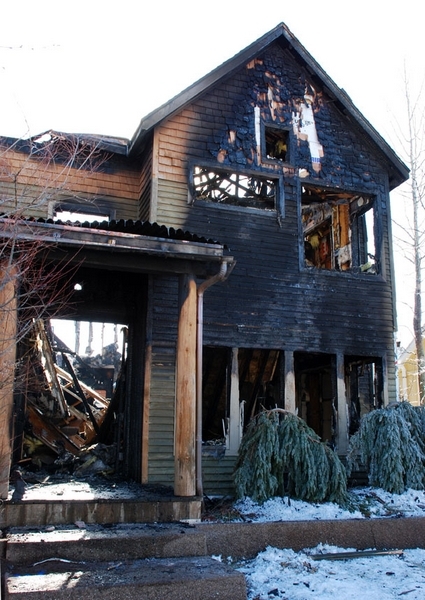 Investigators for the insurance carrier also visited the site. Plaster declined to comment on the results of the company’s investigation. It is against company policy to discuss individual cases, he said. Basalt Police Sgt. Stu Curry said “I get the sense” that the insurance company’s investigators concurred that the fire was deliberately set. Curry said police are still checks leads and seeking new information. The CBI lab is conducting tests to determine what type of accelerant was used, Curry sad. There are no suspects in the case, he said. Homeowner Harold “Chip” Unglert has an alibi for his whereabouts the evening of the fire and two renters have agreed to take polygraph tests, Curry said. Anyone with information is urged to call Sharon Holdcroft of Safeco at (720) 497-9461; the Basalt Police Department at 927-4316; or contact Eagle County Crimestoppers at 1-800-972-TIPS or online at http://www.tipsubmit.com.